Description: 6 1/4″ – 6 1/2″ All birds have white outer tail feathers and a dark eye. 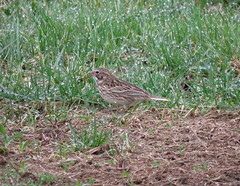 Adult male “slate colored” has mostly slate gray plumage except for white belly and undertail coverts. Bill is pink. “Oregon” birds hanv black hood, reddish brown upperparts and white underparts with a reddish wash on the flanks. 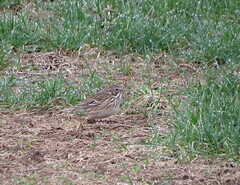 Adult female “slate colored”, the gray elements of the plumage are tinged rufus, especially on crown and wings. “Oregon” female are paler overall than their male counterparts. Voice: Song is a rapid, trilling tu’ tu’ tu’ tu’ Call is a tongue smacking “tchht”. Habitat: Common in coniferous and mixed forests. Present year round in central parts of range but common in summer to Northern Boreal forests. Winters throughout U.S. in scrub and woodland. Nesting: Females will take anywhere from 3-7 days to build the nest, either on or off the ground. The female will lay 3-6 eggs that range from white, gray, pale bluish white, or pale greenish white, speckled with brown, gray and green. Sometimes they can be unmarked. FYI’s: Sometimes called “Snowbirds” they are frequent visitors during the winter to your feeder if you live in the middle latitudes. Some Junco’s that stay year round in the Appalachian Mountains, breeding in higher elevations have shorter wings than the ones who migrate. 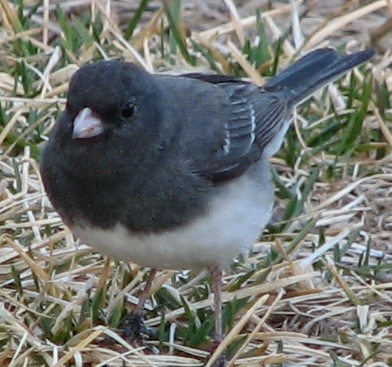 The oldest recorded Junco was 11 years 4 months. A key field marking on the Junco will be the white outer tail feathers as they flash when they fly. 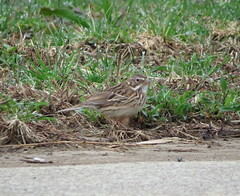 This entry was posted in Spotlight On Ohio Birds. Bookmark the permalink. I love the little Juncos and they signal the beginning of winter in my area of NH. There is snow on the ground here today and they are everywhere! Thanks for the visit to my blog. I know that winter is not far away when I see these little guys. Handsome birds!